> For the second summer in a row, I am departing from the lectionary to preach a sermon series. To continue to give my congregation a balanced diet of Scripture, I have discovered that one of the great joys of doing this is in creating a lectionary to follow the theme of the series. I especially relish selecting Scriptures that are little used or not particularly obvious given a specific theme. This does not always work (I do often go with familiar passages), but it does allow me to do some deeper reflection on how the canon holds together in ways that go beyond the three year cycle I have been preaching from for over 14 years. This summer’s series is Creo / I Believe: What Christians Believe and Why it Matters. 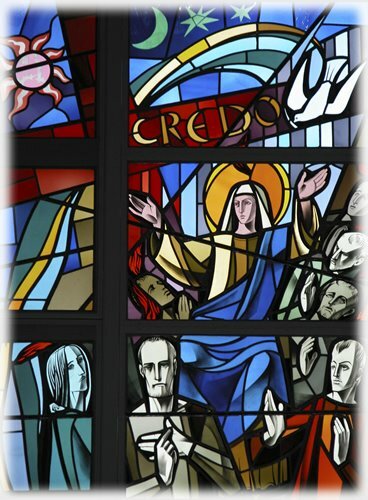 It is an exploration of faith using the clauses of the Apostles’ Creed. The lectionary for this series is not yet complete, so if any want to chime in on possibilities for the upcoming weeks – feel free – it could make for some interesting Bible discussion.